An Israeli court yesterday extended the detention of Palestinian cartoonist Mohammad Saba’aneh, who has been held since Saturday without charge or access to his lawyer, according to news reports. The Committee to Protect Journalists calls on authorities to immediately release the political cartoonist and allow him access to his lawyer. The military court extended Saba’aneh’s detention for nine days, the Palestinian Center for Development and Media Freedoms (MADA) told CPJ. Israeli authorities said they were investigating the cartoonist for providing services to unspecified “hostile organizations,” according to Saba’aneh’s employer, the Palestinian daily Al-Hayat al-Jadida, which cited the cartoonist’s lawyer. 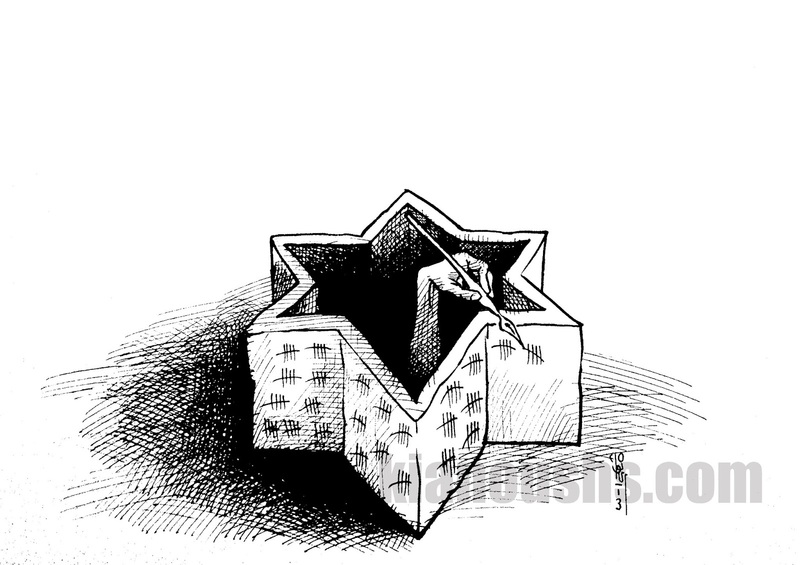 Saba’aneh works as a political cartoonist for Al-Hayat al-Jadida, and has depicted imprisoned Palestinians in his most recent cartoons. One, published on February 17, shows a mirror on the wall of a prison, revealing prison bars in its reflection. More than 300 Palestinians are being held without charge in administrative detention in Israel, according to B’Tselem, an Israeli human rights group. Saba’aneh was detained on February 16 while crossing the Allenby Bridge checkpoint from Jordan after returning from a conference for his work at the Arab American University, according to news reports. He is being held at the Jalemeh detention center near the northern West Bank city of Jenin, MADA said. It is not clear if Saba’aneh is being held under “administrative detention.” Under Israeli law, prisoners can be held under administrative detention indefinitely without formal charges being filed against them. Local press freedom groups said they believed Saba’aneh’s arrest could be part of a larger crackdown on the Palestinian press in the region. In January, Israeli soldiers prevented about 20 international journalists from covering the eviction of a Palestinian campsite in the West Bank. Another international journalist was briefly detained in the West Bank, according to news reports. Three Palestinian journalists remain in administrative detention in Israel, two without charge, according to CPJ’s annual prison census conducted in December. CPJ’s calls to the Israeli authorities were not immediately returned. In 2010, Saba’aneh visited the United States as a member of the State Department’s International Visitor Leadership Program, and he was a guest of the Cartoonists Right Network International’s annual Award for Courage in Editorial Cartooning.